I think you've got a winner there with the lighter blue and the gold unis. Drop the darker blue. I like it, but the lighter blue just looks better as much as I hate to admit it. The two tone stripe is a good element to use, especially on the alternative uni, so I understand wanting to keep it. Good update here! Thanks, I'll repost them properly later on when I put the final two schools up. Here we finally have the final two schools, plus a proper re-post of Golden Sands High/University. In some form, a school has existed in Turrif for as long as Roeburgh Hub has existed, but due to Turrif's hard working nature, the focus was put squarely on the port. In 2008, it was decided that the second dual school (High School/University) would be opened in Turrif, allowing the students living in the greater Turrif area to attend school and university at a reasonable price. Compared to the other dual school (and other schools) Port City finds itself disadvantaged academically, being largely down to the lack of importance of schooling in the area. Neither the University or the High School have uniforms, which for most schools would create attendance issues, but at Port City, it seems to help attendance. The school's HoopBall team is known for its toughness and determination, a cornerstone of life in Turrif. Founded in the early 1970's, Seiichi Hoshino High originally opened as Jarran High School, but the name was quickly changed after the school's founder and first principal died in a car accident just 3 months after the school's opening. To this day the school still operates to Hoshino's vision: Allowing students from all walks of life to have a fair and proper education. 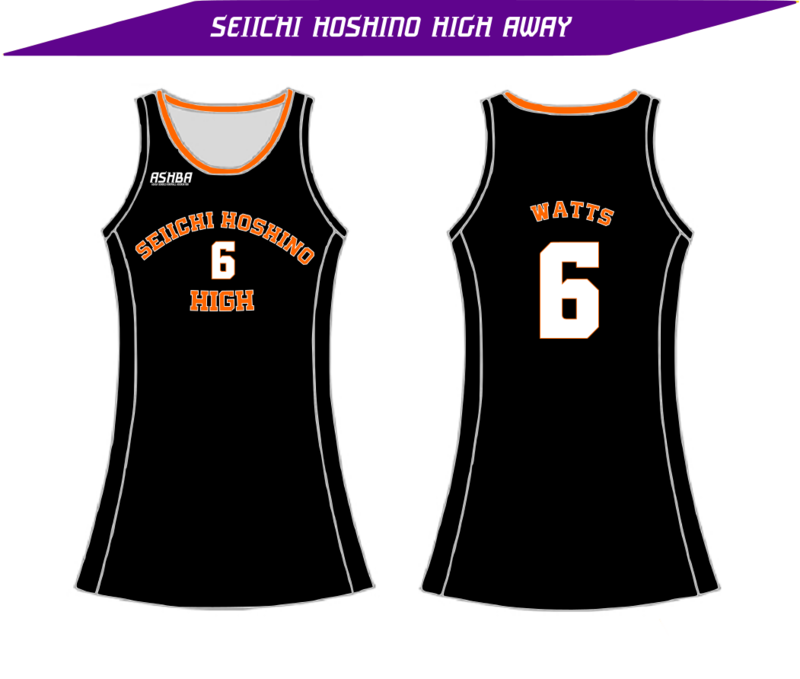 The school's colours of orange and black were originally chosen by Hoshino, as his favourite animal was a tiger. Aesthetically, not much has changed at the school since 1973 in terms of uniforms and sports uniforms, but after recently (2009) going through a huge renovation, the school itself looks new. The HoopBall team has been consistently the worst team in the ASHBA, but often finishes above Chibihasa High when they have a bad year. 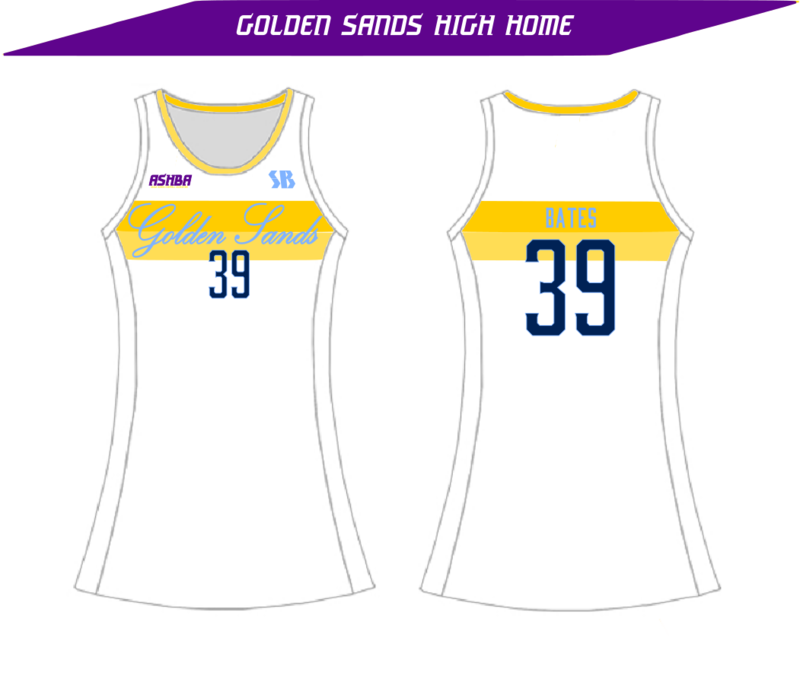 The uniforms are supplied by a local Jarran company, who have never been named, but have supplied the team's uniforms in an extremely similar design since 1973. Following a friendly game between the High School and University, students in the HoopBall program spoke up about the difficulties seeing all the details on their uniforms. 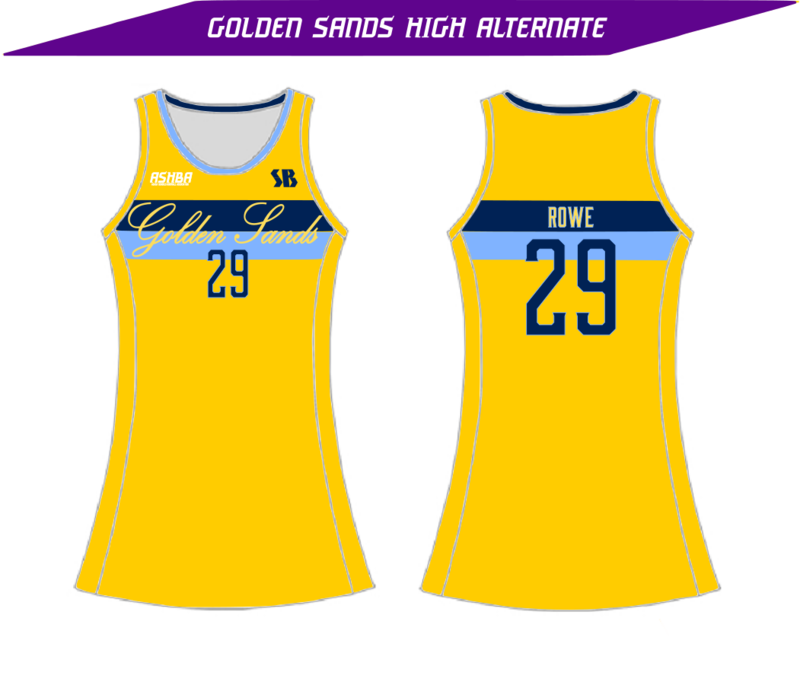 In response to this Golden Valley worked with SB to fix the uniforms, and when introduced to the players and school community, many positive messages were sent in reply. The previous uniforms have been redesignated as practice uniforms. Well that's all for now, the next time I return will likely mean results for Weeks 21 - 31 in the AHBA! And after simulating the last 11 weeks and quite a large amount of procrastination... we finally get to see who has made it to the playoffs, and who gets the first pick. 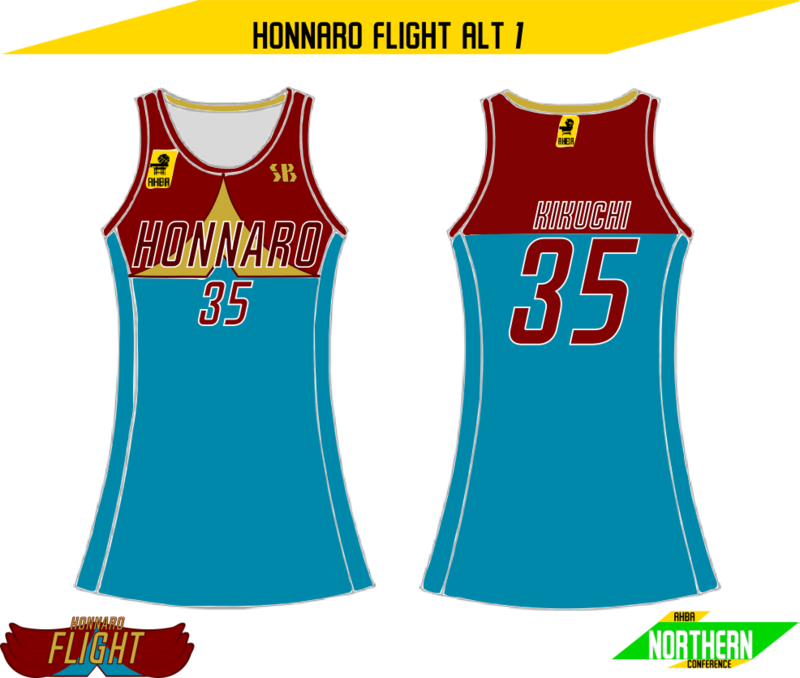 Finishing just above their expansion cousins, with a record of 11 - 20 (5 - 10 home, 6 - 10 away), is the Honnaro Flight. The Flight's season was a surprise to many, being an expansion team. At one point during the season, it looked as if they might have been making their first playoffs appearance, over the heavily favoured Lightning. Whilst the Lightning did move past them in the last 11 weeks, matching Asuka's record is an impressive feat on its own. Team MVP and Rookie of the Year, Brooke Douglas was the catalyst for this, with her incredible defensive ability pushing the rest of the defence along. 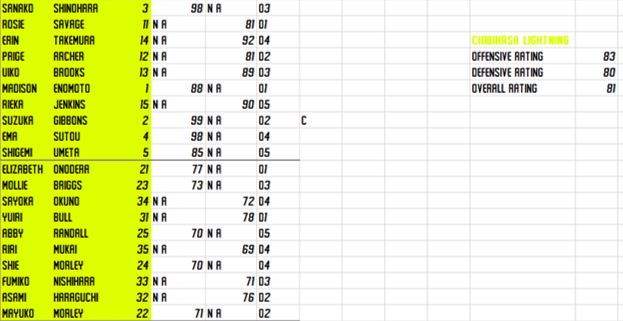 Another interesting note, is Honnaro's almost identical record home and away. This shows that the team should be good enough in the future to win important games, both at home and on the road. The last 11 weeks bought the Flight home just 2 wins, which is part of the reason both Asuka and Chibihasa jumped them in the standings. These wins came in Week 25, in a close game against the Heat and Week 31 against the Magic. If the Flight can bring in a star on the offensive end, then they pose a real threat to beat the Lightning for the second spot in the Northern Conference Finals in 2013. Asuka find themselves in a familiar position close to the bottom of the table. With a record of 11 - 20 (7 - 9 home, 4 - 11 away), it's no surprise to see them 6th. Lacklustre defence for most of the season didn't help their chances, but by the time they finally got it together, it was too late to make the Playoffs. Their lack of offence didn't help that cause either, but can be forgiven, at least with Asuka's average bench. Captain and Team MVP Nana Tomita was by far the best player on the team defensively, putting up numbers that likely would have won her league MVP had this been any other season. Asuka will again have the 3rd pick in the draft, which should be used to bolster their offence off the bench. The last 11 weeks for the Magic included 4 wins, the first of which in Week 22, against the Lions by 1, Week 23, against the Flight, Week 26, against Jarran, and Week 30, again against Honnaro. Asuka's rebuild is still in motion, despite being damaged by league expansion. 5th place and 2nd in the Northern Conference is the Chibihasa Lightning. With a record of 14 - 17 (10 - 6 home, 4 - 11 away), it seems strange that a team with a negative record could make the playoffs, but due the Southern Conference being the stronger out of the two, the Lightning scrape in. Their record sits just below .500, which comes mostly from their offence. This season has made it clear that Suzuka Gibbons is undoubtedly a high caliber player, the team captain once again won Team MVP and was 3rd in league MVP voting, despite putting up better numbers than her MVP season last year. The rest of the offence clicks around her, but more help off the bench would be a help, considering the minutes Gibbons plays. 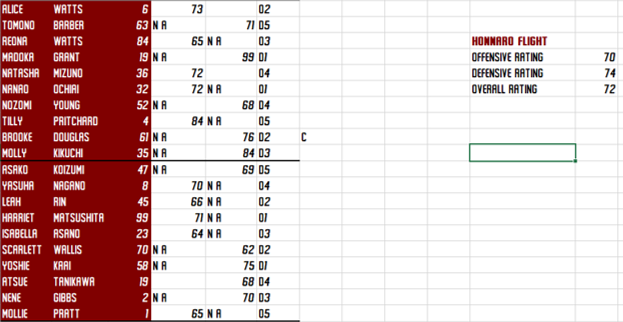 A slight improvement defensively would also improve the -60 PD, and push the Lightning closer to championship contention. Chibihasa's last 11 weeks were fantastic, with 7 wins vaulting them past Asuka and Honnaro. These wins came in: Week 21, Week 22, Week 24, Week 26, where Gibbons once again broke her career high in points, this time scoring 43 again against Honnaro, Week 28, where O1 Madison Enomoto recorded 11 assists most of which went to bench O2 Molly Powell, who was starting in place of Gibbons after she tweaked her ankle the week before, Week 29 and Week 31. 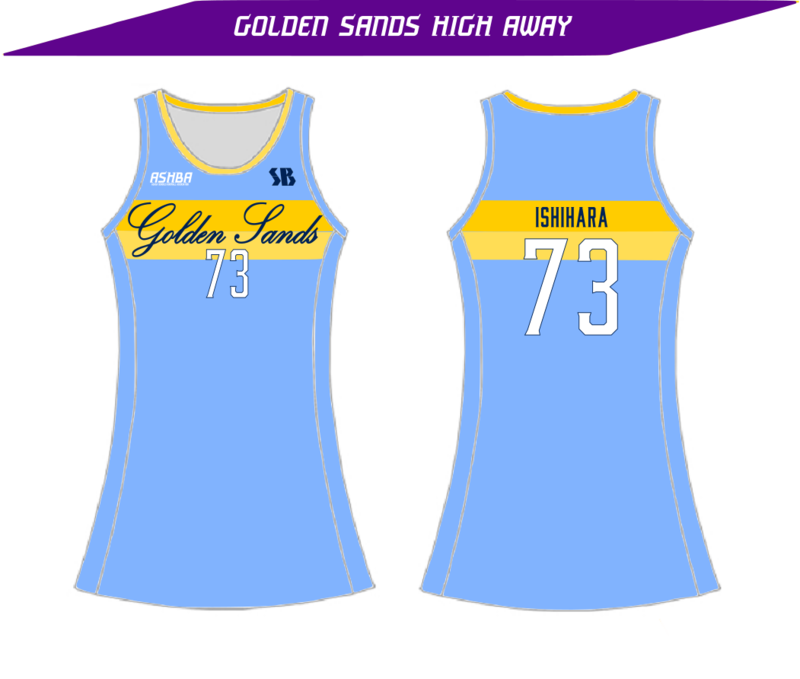 Chibihasa look to be primed and ready for their matchup against the Heat in the Conference Finals, but Suzuka Gibbons knows she can't do it alone. 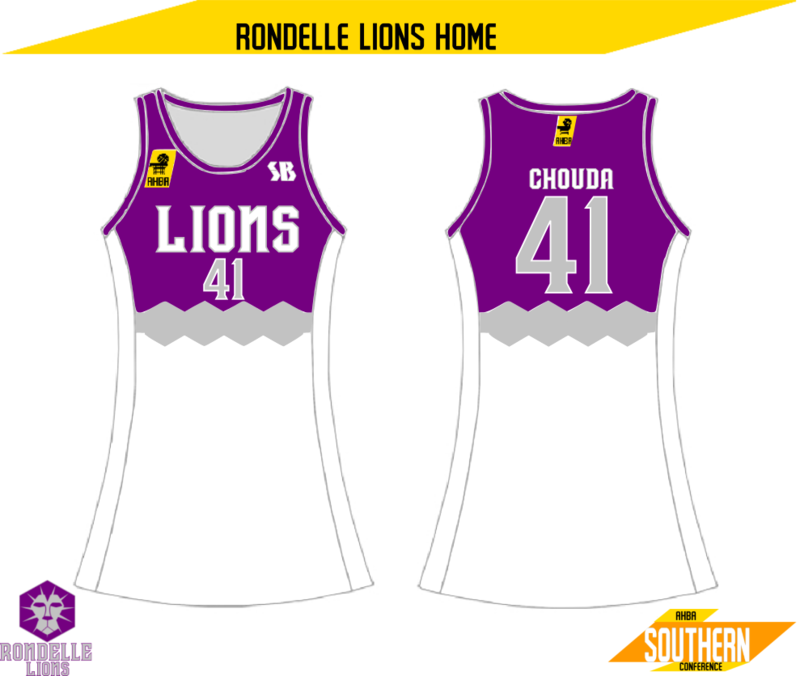 4th and unfortunately missing the Playoffs and the chance to defend their championship, is the Rondelle Lions. A lacklustre final 11 weeks really hurt the Lions, finishing just 2 games back from the Raiders. Their record of 16 - 15 (11 - 5 home, 5 - 10 away) is just over .500, and if they had lost any more games in the last 11 weeks, they would have found themselves behind the Lighting. The Lions seemed to be playing much too casually in the last 11 games, and let their chance slip. The whole team was visibly frustrated and disappointed after a week 29 loss to the Raiders, which put them out of playoffs contention and then even more so in Week 30 where they lost to the Jaguars in Jarran in a poor effort. Rookie Sophie Yoshizawa summed it up best after the Week 30 loss saying: "It's been a disappointing end to the year for us, all the girls are absolutely gutted that we can't defend last year's championship. But that's the way it has to be and I know we will all work extremely hard in the offseason to make sure this doesn't happen next year.." Just 3 wins came in the last 11 games, coming in Weeks 23, 25 and 27. Team MVP went to Megan Murata, which comes as a slight surprise to many outside of the organisation. 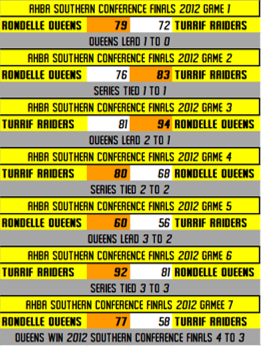 3rd place, and 2nd in the Southern Conference, with a record of 18 - 13 (10 - 5 home, 8 - 8 away) is the Turrif Raiders. After last year's horrible season, it comes as a surprise to see Turrif in the top 3. The Raiders did become a much better team offensively this season but still retained their defensive mindset. An interesting side note is that they finished with a PD of 0, which is worse than the 4th placed Lions. 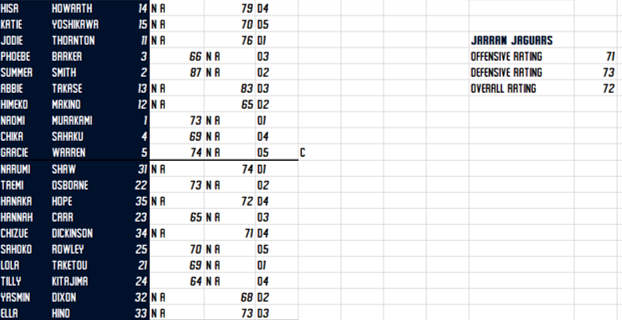 The Raiders are much different team offensively compared to the Lions, which is likely the reason behind the lower PD. The last 11 weeks were pretty average for the Raiders, going 6 - 5. The six wins came in; Week 21, Week 25, Week 26, Week 28, Week 29, where they eliminated the Lions from Playoff contention, off an excellent defensive effort from captain Samantha Tokuta, and Week 31. Bench D1 Jodie Thornton's suspension didn't seem to hurt the team much, with Leah Fujikawa doing an excellent job in her absence. Team MVP went to O1 Chiho Clayton, after averaging 8.9 assists per game along with 9.3 points. The Raiders have a tough task ahead, facing off against an extremely strong looking Queens team in the Southern Conference Finals. 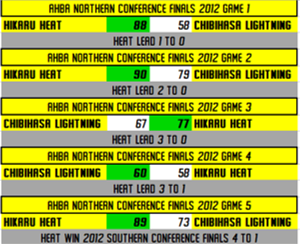 2nd place, and 1st in the Northern Conference are last year's Northern Conference Champions, the Hikaru Heat. 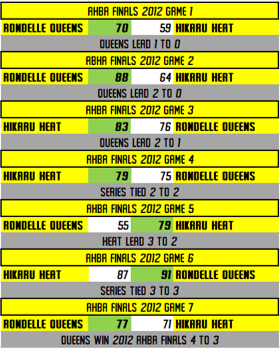 The Heat have had another great year, finishing just 2 games back from the Queens. Their record of 22 - 9 (13 - 2 home, 9 - 7 away), is impressive and actually almost equals the Lions record last year. The continued success of the Heat has caused even the casual fan to notice how good they really are. The last 11 weeks were kind to the Heat, with 8 wins coming in two 4 game win streaks. Wins in Week 21, 22 , 23 and 24 made up the first 4 wins, and wins in Week 27, 28, 29 and 30 made up the second 4. Team MVP went to team captain Abby Mitchell, largely due to her continued skill at leading the team on and off the court. The Heat look poised to once again win the Northern Conference, and make it to the Finals for the 3rd straight season. The main concern for the Heat after this season is keeping as much of this team together as possible. 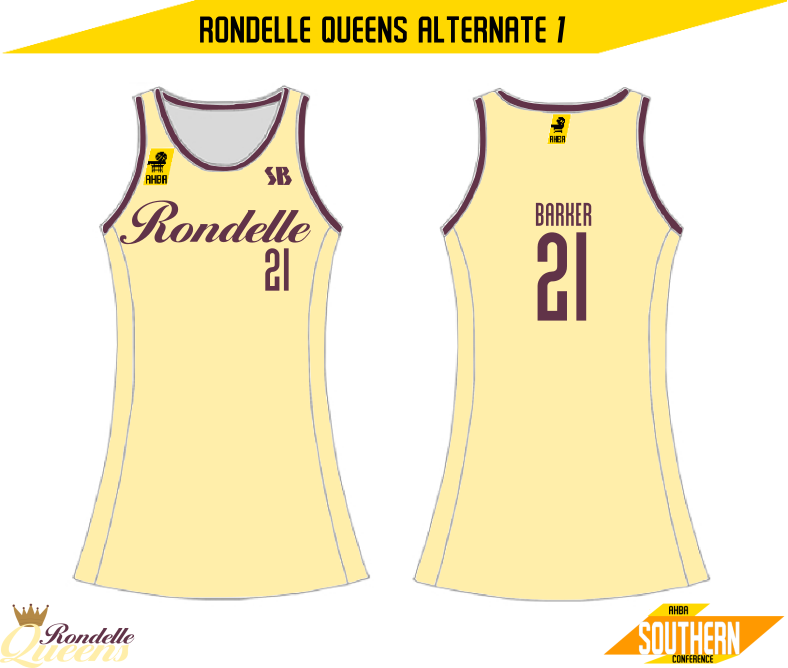 1st overall and in the Southern Conference is the Rondelle Queens. After last year's drastic improvement, the Queens have gone from strength to strength, to the point where they are now the favourites to win the championship. A record of 24 - 7 (16 - 0 home, 8 - 7 away) this season has propelled them to the top of the AHBA. Their perfect home record is also a major achievement, and is something the Lions were close to achieving last season, which gives the Queens the leg up in popularity. The dual O5 lineup has proved to be fruitful for the Queens, and the addition of "Showpony" Gaudenzia Dironi has been beneficial for the Queens' bench. Weeks 21, 22, 23 and 24 brought the Queens 4 wins, with a close 1 point victory against the Lions being the lone scare. The final 5 weeks (Weeks 27, 28, 29, 30 and 31) brought 5 more wins for the Queens, bringing their record for the final 11 weeks to 9 - 2. Team MVP went to captain Yumemi Koyama, who also earned league MVP for her stellar defensive play throughout the season, averaging 3 steals a game, along with countless shows of excellent defence in close games. Dironi earned Sixth Woman of the Year for her exciting play off the bench, but was surprising that she was not in the conversation for Rookie of the Year. The Queens look to be ready for the Finals already, but they first have the gritty Raiders in their way. "Congratulations to everyone on yet another great season. Freya and I are excited to see what the first ABHA Playoffs brings us, with the two of us going to be courtside during various games throughout the Conference Finals and Finals. The Conference Finals begin October 29, with the finals beginning on November 19 and finishing December 1st should there be seven games." "Karen and I hope that you all enjoy the Playoffs just as much as we will, and I can't wait to see packed arenas for every Northern Conference Finals and Finals game! 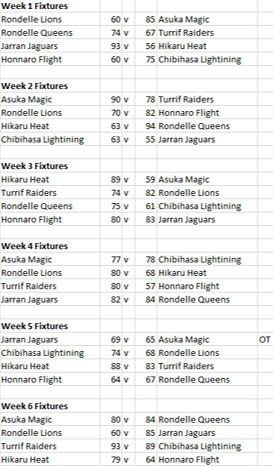 That's all for now, but the full AHBA Playoffs will be put up soon, considering they have already been simmed. If you want to know more about any team and or city, I'm happy to tell you more. Finally, I can be bothered to put up the Playoffs! These will only be a short writeup, much the same as the Finals have been previously. Only two games were won away from home in the Queens 7 game win over the Raiders, showing that both teams could hold home court extremely well. This series was unexpectedly long, with many counting out the Raiders early. Aside from Games 1, 2 & 5, the weren't that many close games, making the series much more intense. Great efforts from various Queens throughout the series, including Gaudenzia Dironi's playoff record 13 assists in game 7 pushed the Queens over the line, and into the Finals. The Northern Conference Finals were Hikaru's to lose, and they pulled out a 4 - 1 series win over Chibihasa. 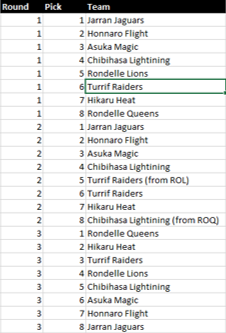 Chibihasa looked over matched throughout the series, considering their lack of Playoff/Finals experience. As usual, Suzuka Gibbons was incredible, but none of her team seemed to step up when needed. The team still seemed lost even during their Game 4 win, where Gibbons dropped 33 points, 3 of which came with just 2 seconds to go. Hikaru were just too good for the Lightning's defence, earning themselves their 3rd straight Northern Conference title. 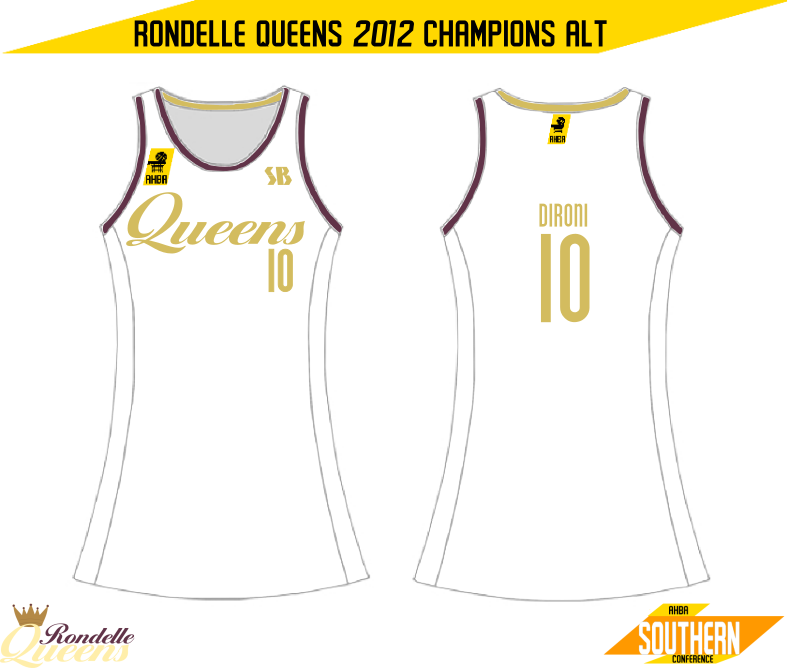 And after the second seven game series of the Playoffs, the Rondelle Queens have won the 2012 AHBA Championship. For the 3rd year straight, the Heat have made the Finals and lost to their Southern Conference foe. The series seemed close no matter the score on the scoreboard at the end of the game, considering that after Game 4, the series was tied 2 - 2, with two home games left for the Queens, The Heat were once again just one game away from winning after Game 5 but were unable to match the Queens 4th quarter run in Game 7, which ultimately led to them falling at the final hurdle. The Queens win their first AHBA Championship, after winning 2 of the last 3 games by very slim margins. Finals MVP (and Season MVP) Yumemi Koyama was a big part of those wins, after holding Sanako Shinohara to just 13 points over the last 3 games. The rest of the team also pitched in, with the Dual O5's Natasha Barber and Emma Suga putting up big numbers in both points and rebounds. 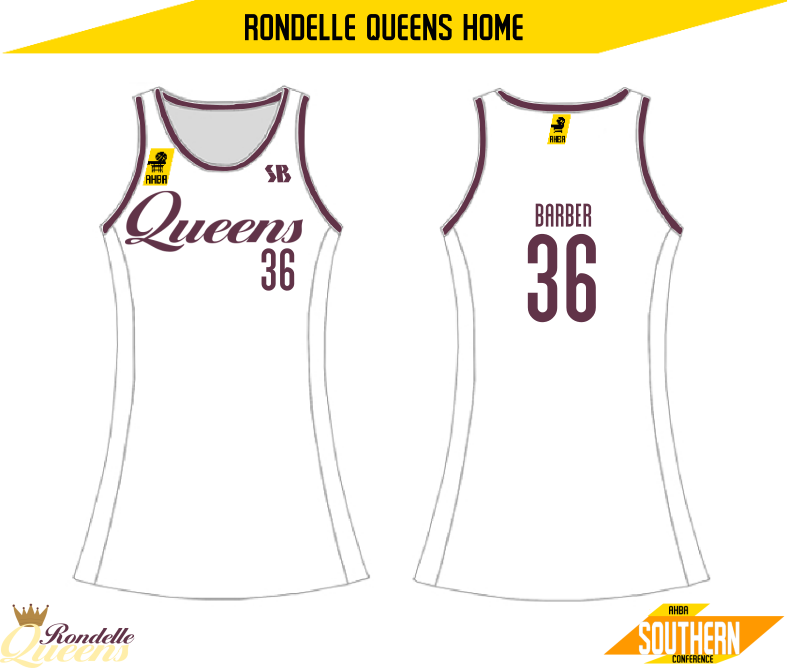 "Congratulations to the Rondelle Queens for winning the AHBA Championship. A congratulations should also be given to the Hikaru Heat, who, after reaching this years finals, have made 3 straight Finals appearances." "It was an amazing series to watch, and I know that Karen and I, and all of you are excited to see if the Queens can defend their title next season!" Lions championship hangover. Hopefully they actually learn from this and get back to championship form soon. Why was Megan Murata's MVP a surprise? Hikaru drops another championship. I'm starting to feel bad for them and their fans, but three straight finals appearances are pretty impressive. Any more expansions on the horizon? I would say if they didn't play so badly in the final 11 weeks, they would have at least made the playoffs. I wouldn't be surprised to see them in the Playoffs next season. It came as a surprise to many, as many expected Madoka Grant or one of the offensive players to win it. I too feel bad for them and their fanbase, but I agree, the three straight finals appearances are impressive, and should keep the fans and team hungry. They too will likely be back in the Playoffs next year. Expansion is a topic that is once again on the league's mind. 2014 seems to be a likely time for another expansion, but that may depend on how each team is built after 2013. 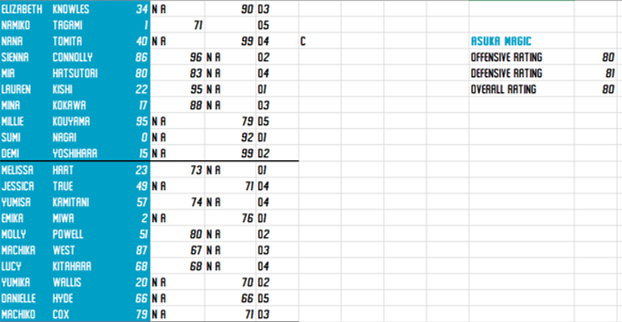 Considering this is a big offseason, the teams should balance out a bit, meaning an expansion in 2014 is likely. Its offseason time! This year will bring the largest amount of changes to all the teams, with just about every player out of contract. Who will end up where? Another big question on most teams minds is who to draft, with 50 young women declaring for the 2013 AHBA Draft. This year also features two non Asacans, Alicia Naylor, a D5 from Broadway, North Eslia and Abby Randall, an O5, from Ocean Bluff, New Iberia, USE. The Queens trade away their second round pick to the Lightning for last year's 13th overall pick O3 Ava Konishi. To make room for Konishi, they let Phoebe Leonard, an undrafted O3 go into the free agent pool. The pick may benefit the Lightning in some way, making the trade somewhat even. The Lions trade D4 Sena Howard and their second round pick to the Raiders for D5 Aiko Stephens. The Raiders let D4 Namako Wallis enter free agency. This trade benefits both sides, more notably the Lions, as they gear up to make the Conference Finals next season. 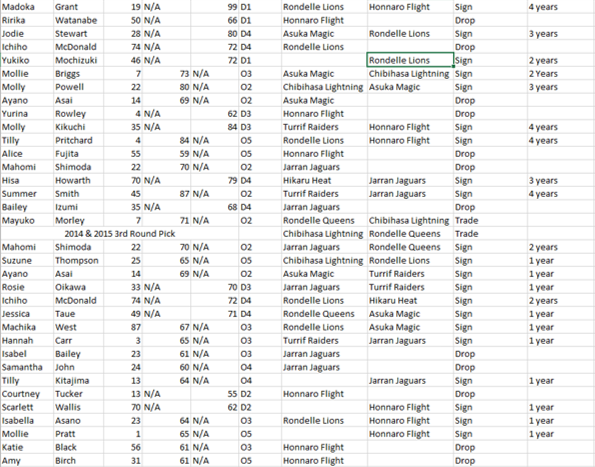 As mentioned earlier, 50 young women entered the 2013 AHBA Draft, two of which are from Eslia and the USE respectively. This years draft will play out with 24 of the young women getting drafted. The Jaguars finished last in 2012, earning them the 1st pick, and the right to host the 2013 AHBA Draft. Honnaro and Asuka hold picks 2 and 3 respectively. Seiichi Hoshino's Ella Hino (D3), Alice Watts (O2) and Amelie Wallace (D3), Golden Sands' Grace Ishihara (O3) and Imogen Bates (D5), Asuka High's Hanaka Hope (D4), Natasha Mizuno (O4) and Tsuguka Murphy (O1), and Osyth Girls' Nijino Kurokawa (D5) have all shown tremendous potential, and could be the next big stars in the ABHA. This offseason has been the busiest ever, with so many players changing teams. Many of the signings were once again to fill roster spots, due to some of the larger signings. 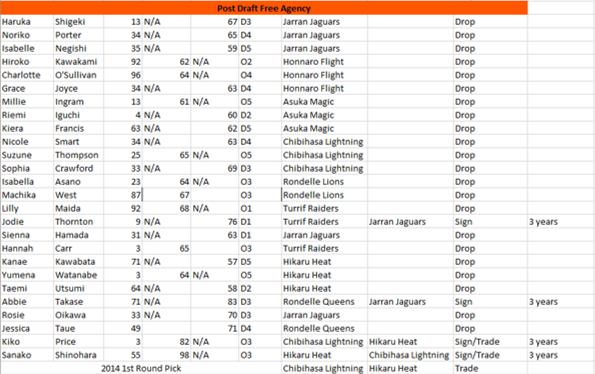 Jodie Thornton, Abby Takase, Hisa Howarth and Summer Smith all joined the Jaguars on long deals, with the hope that the young talent the Jaguars have from the Expansion Draft and Drafts will blossom later on. The Flight too bolstered their young talent with long deals for Madoka Grant, Molly Kikuchi and Tilly Pritchard, all of which are talented in their own right. Chibihasa complete a sign and trade with the Heat for Sanako Shinohara, giving up a 2014 first round pick and Kiko Price. There were many rumours that the Lightning were interested in Shinohara, and this deal gives them even more offensive firepower. The Heat get a quality player in Price and what may be a high to mid 1st round pick.The Lions signed Jodie Stewart, who was solid during her time on the Magic bench, and should get more chance to prove herself in Rondelle in a starting role. 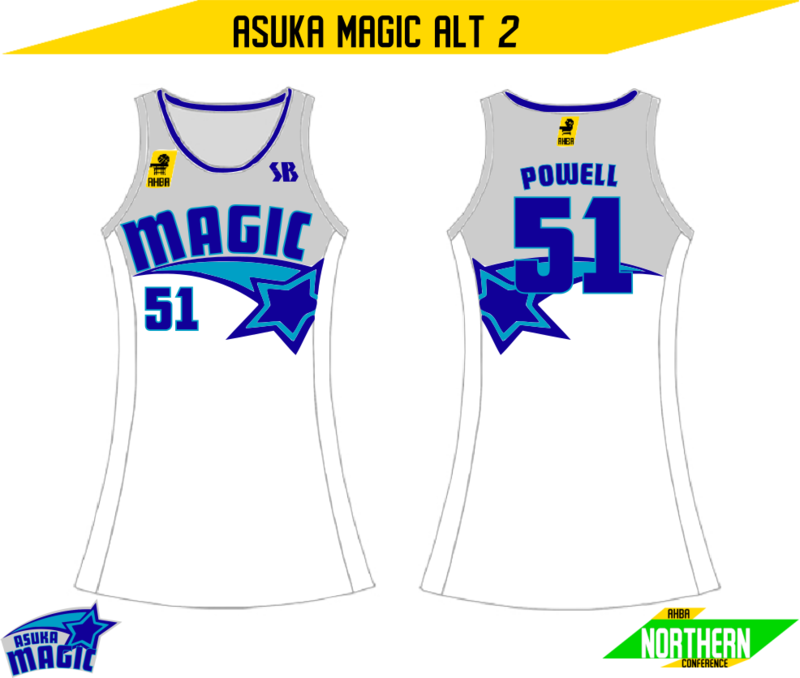 The Magic get ex-Lightning O2 Molly Powell, who should improve their offence greatly, considering Powell's time backing up Suzuka Gibbons. 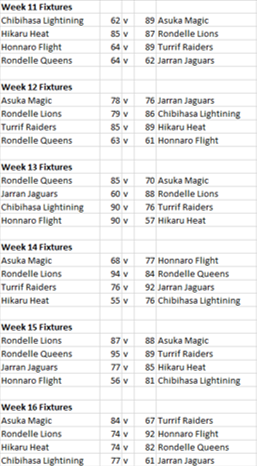 "Today, the Asuka Magic, Rondelle Queens, Rondelle Lions, Honnaro Flight all unveiled reworked logos and uniforms, which along with official press releases from SB, can be found below." 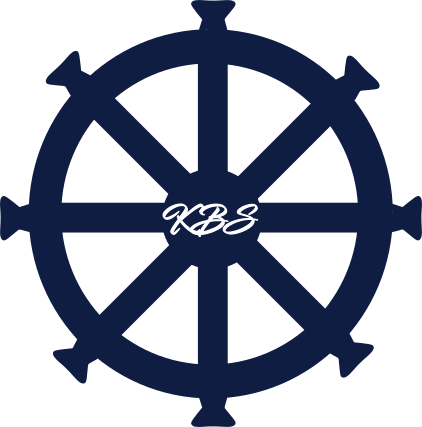 - Official AHBA website, ahba.com.ac, February 22, 2013. SB has worked with the Magic to slightly rework their Alt 2 uniform to include more of their colours. The top half of the uniform now resembles the main logo in terms of colouration, with Light Magic Blue added to remove the monotone look This uniform is once again intended to be worn exclusively at home, just as the previous iteration of this uniform was. The uniform is as to be worn by new backup O2 Molly Powell. 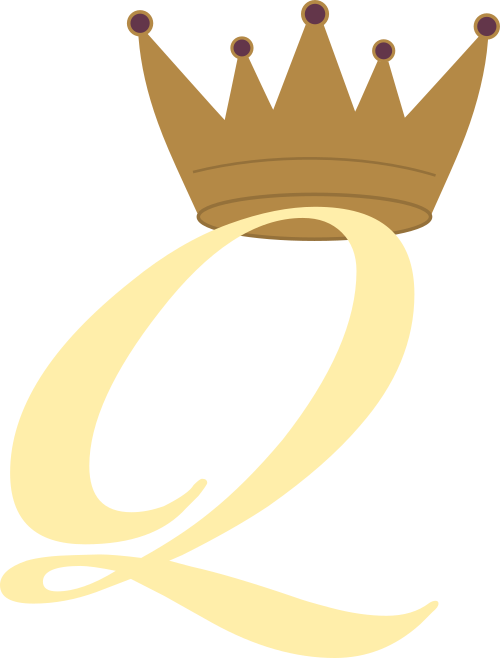 After the response to their 2012 rebrand, SB and the Queens have brought back the "crowned Q" logo set, which has been updated for the newer colours. Along with this, the crown has been tweaked, as have all of the Queens uniforms. The Home uniform and Alt 1's name on back have been moved down slightly. The largest change has happened on the Away uniform, with a Queen's Cream wordmark and numbers replacing the Old Gold versions of both from 2012. Old Gold has been changed to the Queens tertiary colour, with Queen's cream becoming their secondary colour. 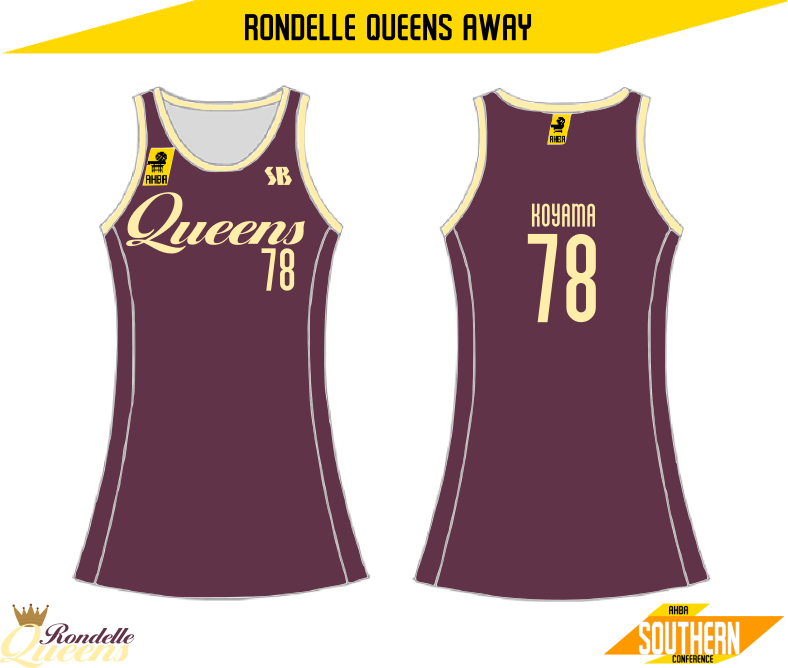 The Queens have also received a 2012 Championship Alt, which features a Gold wordmark and numbers in place of the Queen's Plum wordmark and numbers on the Home uniform and a gold back collar. The Lions in late 2012 were told by the league's head office to fix the colour balance on their Home and Away uniforms. After 3 years of wearing mostly grey uniforms on the road, SB has switched the Home and Away uniforms' designations, promoting a tweaked version of what in 2012 was the Lions' Away uniform to home use, and what in 2012 was the Home uniform to away use. 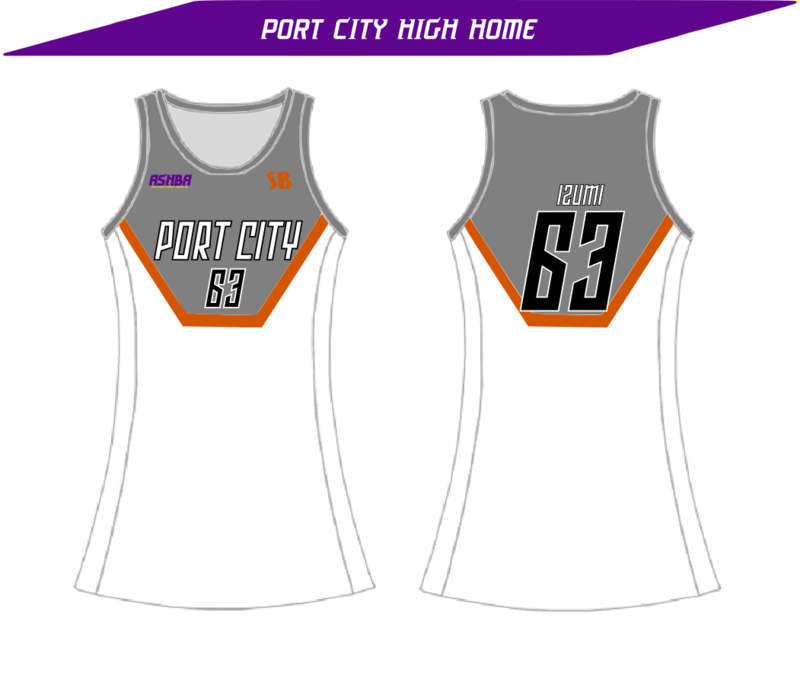 The Home uniforms now feature a Royal Purple top section, with a Shield Grey "hexagonal crown" section (white in 2012) and a white bottom section (Shield Grey in 2012). The wordmark and name is now white and Shield Grey, with Shield Grey and white numbers. 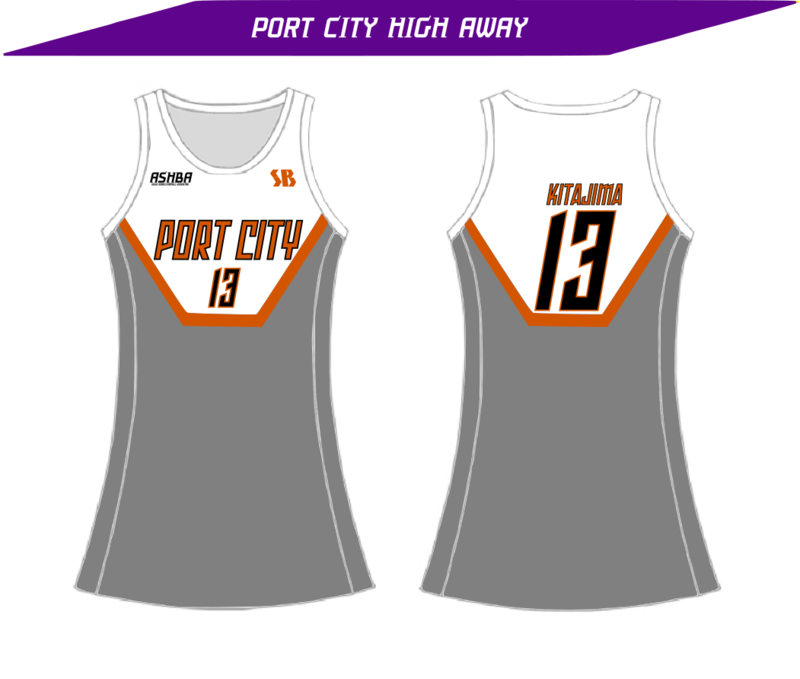 The Away uniforms are identical to the 2012 Home uniforms, aside from the Royal Purple and Shield Grey wordmark and name, and Shield Grey and Royal Purple numbers. The Alt 1 is also identical to their 2012 version aside from number colours, which are now white and Royal Purple to better match the changes made the home and away number colouration. SB tweaked a few things in the Flight's identity, most notably the position of "Honnaro" on their main logo. "Honnaro" is now straight, giving the logo a much cleaner look. The Away and Alt 1 have had the colour of their wordmarks changed. 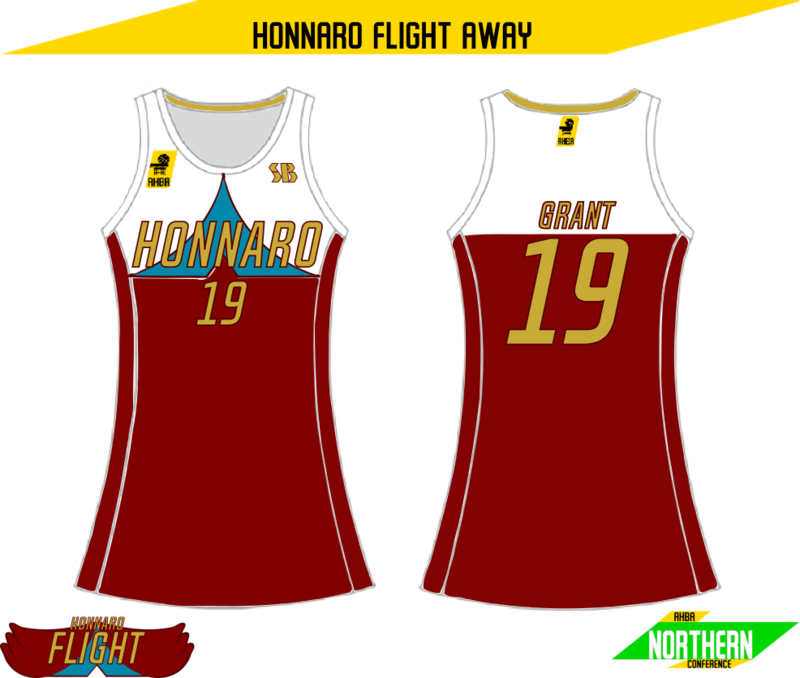 The Away uniform's wordmark is now Honnaro Gold and Dark Wing Red, giving it a similar look to the teams Home uniforms. The Alt 2 now has a Dark Wing Red and white wordmark, which was changed from Afternoon Blue and white for legibility reasons. "With all the changes made to the teams in the offseason, this season should be quite entertaining to watch. We sit down with one of this year's most prized free agents and new Lightning player Sanako Shinohara to find out how her offseason went down. AsacaHoops: Thanks for coming along and giving us your insight into what has been quite a busy start to the offseason for you. Sanako Shinohara: No problems, I think it might be interesting for fans to find out a bit about what goes on behind the scenes. AH: It's safe to say that many people saw your move to the Lightning as a pretty obvious choice, but not the way it went down. SS: It's the first move of its kind in the AHBA, so naturally people wouldn't have expected it. It was the best way to do it for everyone involved I reckon. AH: So next question continuing on from that, were you always planning to join Suzuka in Chibihasa this season? SS: I think the only way I wasn't going to leave is if we won a Championship. So yes, in a way I was, but I was really hoping we could have got it done last year. AH: We'll talk more on Suzuka later, but how hard has it been to leave Hikaru and set yourself up again in Chibihasa? AH: It seems surprising that many didn't see you moving. Could that be down to where you were living in Hikaru? SS: No one actually knew where I lived in Hikaru aside from Suzuka and the Heat girls, at least to the best of my knowledge. It helps that I'm pretty introverted too. I never went out much aside from practice, games and team dinners. AH: Many saw you as quite cold during your time in Hikaru, particularly when talking to the media. Was that intentional or just your introverted nature? SS: It was slightly intentional, particularly when I was getting bombarded with questions about joining the Lightning. It's mostly just me being introverted though. AH: You and Suzuka really hit it off in 2010, what caused that? SS: I just enjoyed her presence. She liked to work hard, just like me, so it was usually me and her still in the gym after practice. We just started talking then and it went from there. AH: Did she have any influence on your move to Chibihasa? SS: Definitely. I've always wanted to play with her again after she left in 2011. We've kept in touch throughout the past 2 years, and we both saw an opportunity to make it happen. It was a real shame it had to get out to the media... I would have much preferred it didn't. AH: Will we be seeing a more media friendly Sanako from here on out? SS: Maybe. We'll see. This interview isn't something I'd normally do if that's any indication. AH: You seem to be quite a nice person beneath all that introversion, which is what seemed to finally get through to your teammates last year. We've heard Abby and others say time and time again that you often buy things for your teammates particularly at Christmas time. Is that something you enjoy doing? SS: Yeah definitely. It's a nice feeling to know that they appreciate the gifts, and I fully intend to continue here in Chibihasa. AH: Will we maybe see some form of charity started or endorsed by yourself? SS: It's definitely something I've put thought into. Maybe when I've finished my playing career. 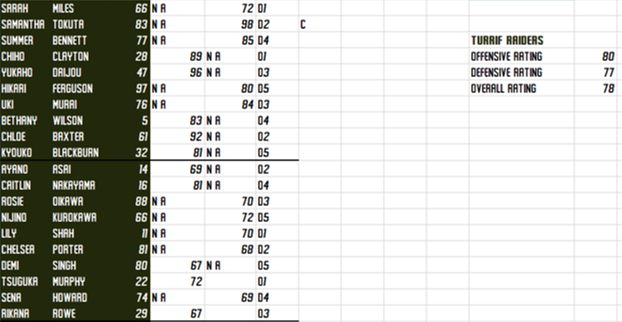 AH: Alright, one last question: Where do you rank your new team in terms of Championship chances? SS: I reckon we have a pretty good chance to make it back to the Conference Finals, and if all goes well, a Championship might be possible. I'm not gonna hype anything up just yet. AH: Well, thanks for your time and good luck for the season ahead. How do you feel about Sanako and her move? C&C is appreciated for both the tweaks and the "mysterious logo set". I do enjoy your player interviews. It adds an extra bit of flavor to your world and to your league. Keep those coming! It'll be interesting to see how the Heat fare without Sanako and how the Lightning fare with her. Getting a great player doesn't always give teams instant success so hopefully Chibi doesn't struggle out of the gate or that team could fall apart completely. I'm looking forward to the season! Thanks, I agree, they really help give a bit more character to the league/world. It will definitely be interesting for both teams, and will definitely shake up the Northern Conference. All eyes will be on Chibihasa to perform. Kiko Price should get more attention too, considering everyone will likely look at how she'll fill Sanako's spot in Hikaru. "It is with great pleasure that Freya and I can announce that the AHBA 2013 season has now officially begun. 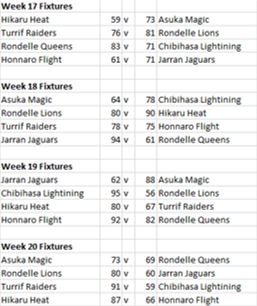 Opening week will bring us some interesting games, with tonight marking the first game, with the Rondelle Lions up against the Asuka Magic here at Air Asaca, which Freya I will be courtside for. Friday brings game two, with the 2012 AHBA Champions, the Rondelle Queens facing off against the Turrif Raiders, also here at Air Asaca Arena. Freya and I will also be here for the banner raising and presentation of the Championship Rings." "On Saturday, Karen and I will be at the Syncamore Insurance Arena to see the Jarran Jaguars take on the three time Northern Conference Champions, the Hikaru Heat. 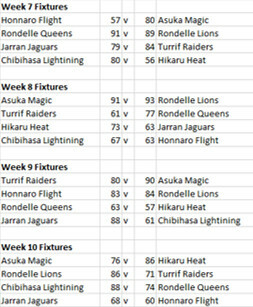 Sunday will see the Honnaro Flight taking on the Chibihasa Lightning at Honnaro Arena. Karen and I are looking forward to all of the games this week and to find out what the rest of the season season will bring." Disappointing is the only way to describe the start of the Flight's season. 1 - 9 (0 - 5 home, 1 - 4 away) in the first 10 weeks is not very encouraging. When asked about what was going on behind the scenes in Honnaro in Week 8, both captain (and 2012 RotY) Brooke Douglas and new signing Madoka Grant had little to say. Douglas however offered that "there's lots of new faces this year, so we need some time to gel." 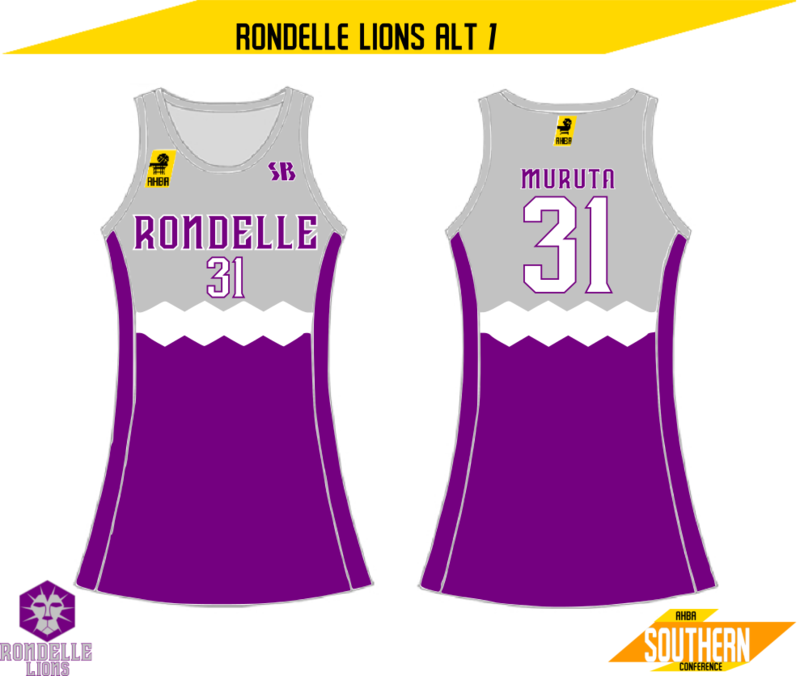 The one game they did win was against the struggling Lions in Week 2, where Grant's knowledge of her former team's offence helped her to record a Flight and AHBA record 11 steals. Douglas also picked up 3 steals in a gritty defensive effort. In Week 3's 3 point loss, new O5 Tilly Pritchard pulled down 13 rebounds along with 23 points (1/2 from 3), narrowly missing the game tying 3 in the dying seconds of the game. A concern for the Flight is their current inability to score consistently, with only 2 offensive players averaging over 10 points. Their inability to win at home is another issue that will need to be addressed soon. It seems that last seasons return to the playoffs may have been a fluke for the Raiders. Gutted of quite a few of their better players in the offseason, the Raiders should be looking to go into full rebuild mode sooner rather than later. 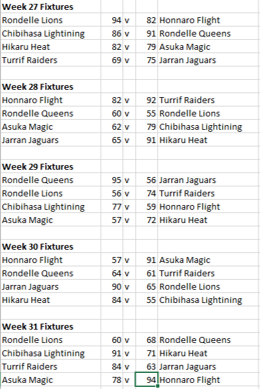 3 - 7 (2 - 3 home, 1 - 4 away) in the first 10 weeks matches Chibihasa's start last season, but the Raiders don't look to be bouncing back anytime soon. Their wins came in Week 4, 6 and 7, against the Flight, Lightning and Jaguars. The surprise win came against the Lightning where O3 Yukaho Daijou put up a career high 25 points, and captain (D2) Samantha Tokuta had 3 steals and 3 blocks in a close win at home. The defense the team was known for is seemingly gone this season, largely due to the players they lost in the offseason, but there also seems to be a lack of effort on the defensive end. 1st round draft pick D5 Nijino Kurokawa has been solid, as have the 3 other rookies the Raiders have this season. After a relatively strong start to the season, the Magic find themselves in a familiar position near the bottom of the standings, sitting at 4 - 6 ( 1 - 4 home, 3 - 2 away) after the first 10 weeks. Off season signing Molly Powell has been quite efficient off the bench, adding an edge that the Magic's bench lacked last season. Their four wins came in Week 1, 2, 7 and 9, with their first win against the Lions being mostly overshadowed by Lions D5 Abby Dunn's injury late in the first quarter. Despite this, the Magic put up a solid effort against a Lions team that looked lost defensively. The other 3 wins came against the two teams below them in the standings, Turrif and Honnaro, so it's obvious that whilst they aren't the best team in the league, they have the tools to become a potential playoffs team. The positive PD is an interesting note, being the only team below 3rd with a positive PD, suggesting that they have soundly beaten the few teams they've won against. The Heat find themselves in an interesting situation, having lost another of their stars in free agency. O3 Kiko Price, who was acquired through the Shinohara sign and trade, hasn't been bad but is struggling to fill the role Shinohara had on the team. Heat captain Abby Mitchell seems to understand this better than most in Hikaru saying after a practice when asked about Price: "She's come in from Chibihasa where she wasn't overly relied on and is now being asked to be the second option, which is obviously a tough thing to get your head around." The Heat are treading water at 5 - 5 (4 - 1 home, 1 - 4 away) and don't seem to be overly concerned about it. They know they can make it back to the playoffs. Despite the lax nature now, they definitely look to be gearing up for the next 21 weeks. Their five wins came in Week 3, 5, 6, 8 and ten, but not once did they beat a team ahead of them in the standings. Their negative PD isn't a particularly convincing sign that they will improve, but they had exactly the same record at the start of last year, and finished 1st in the Northern Conference. The Lions frankly haven't had one of the most ideal starts to 2013. They finish 5 - 5 (2 - 3 home, 3 - 2 away) after losing D5 Abby Dunn on opening night to an ankle sprain for 6 weeks. Without Dunn, the Lions looked very lost on defence, and seemingly had no energy. When Dunn returned in Week 8, suddenly everything had clicked into gear, winning all three of their last three games. Second year D5 Sophie Yoshizawa did a decent job in place of Dunn, but won't be troubling Dunn for her starting role any time soon. 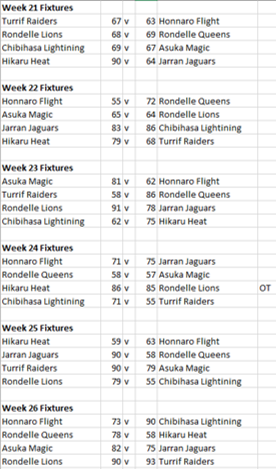 Aside from their three straight wins in Week 8, 9 and 10, their wins came in Week 3 and 4 against Turrif and Hikaru. If the Lions hadn't lost Dunn for 6 weeks, they would easily be ahead of the Jaguars. Expect to see the Lions challenging the Queens in the Southern Conference Finals later this year, despite the sluggish start. Third brings us for the second time in two seasons, one of the 2012 Expansion teams outperforming their low expectations in the first 10 weeks. Sitting a game ahead of the Lions at 6 - 4 (4 - 2 home, 2 - 2 away) the Jaguars are surprising all with their relatively good play. Captain O5 Gracie Warren has continued to show the promise she showed in her rookie season leading the Jaguars offence, along with major help from off season signing O2 Summer Smith. Both seem to compliment each other well, which has been a huge catalyst for the Jags' early season success. Their wins came in Week 1, 3, 5, 6, 9 and 10. Many wins came against the teams that struggled in the first 10 weeks, but the Jags did pull out a win against the Lightning, and lost narrowly lost to the Queens in Week 4. Despite their current winning ways, many still expect the Jaguars to finish closer to the bottom of the league, though this start bodes very well for the future. At 7 - 3 (5 - 0 home, 2 - 3 away), the Lightning find themselves leading the Northern Conference, and sitting 2nd overall. There was little doubt that the addition of Sanako Shinohara to the Lightning's offensive power would make the Lightning the new Northern Conference favourites. Losing only three games over the past 10 weeks is an impressive feat for a team that 3 years ago was almost the laughing stock of the league. Everyone expected that the addition of Shinohara would lower Gibbons' crazy offensive output this year (29.4ppg last season), but by quite a lot more than what has occurred. 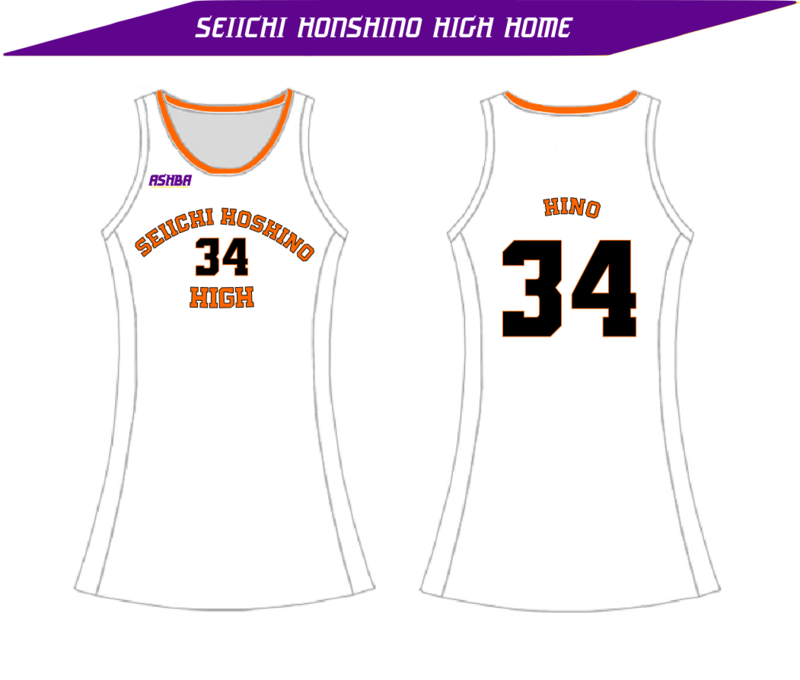 The two have been on fire, averaging close to 45 ppg (19.3 (Shinohara) and 26.4 (Gibbons) ppg) between the two of them. This output makes it seem as if not many other people score for the Lightning, but that couldn't be further from the truth. Most of their wins have been great team efforts, and Shinohara & Gibbons output is just a side effect of what is a well run offence. The Lightning seem to be the closest to besting the Queens, even beating them in the Week 10. Look for more ridiculous numbers from both Gibbons and Shinohara throughout the season and likely well into the playoffs, should the Lightning's stellar play continue for the whole season. "I am here today to announce that two new teams will be joining the AHBA, starting play in the 2014 season. 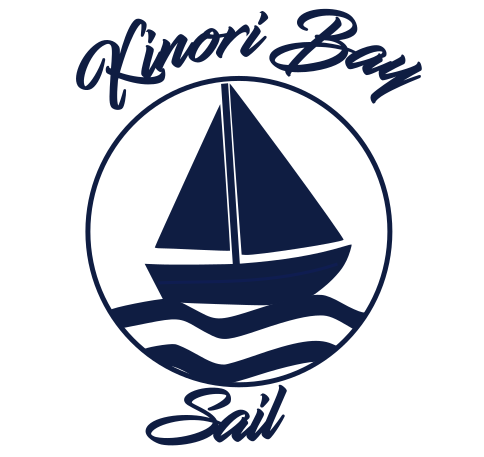 The first of two teams will be playing in Kinori Bay, joining the Northern Conference. The ownership group expects to be able to present the branding for their team in the coming weeks. The second team has yet to be decided, but will be playing in either Haurn Island or Osyth, joining the Southern Conference. A decision should be made also in the coming weeks. I am also happy to announce that, starting in 2014, there will be an annual All Star Weekend. Fans will be encouraged to vote for their favourite players to make the All Star Game. More details will be announced nearer to next year." That is all for now. Where do you think the second expansion team will end up? Can the Queens continue their dominance? How is your team going? It's been a while again, so it's time for another 10 weeks of the AHBA 2013 Season. 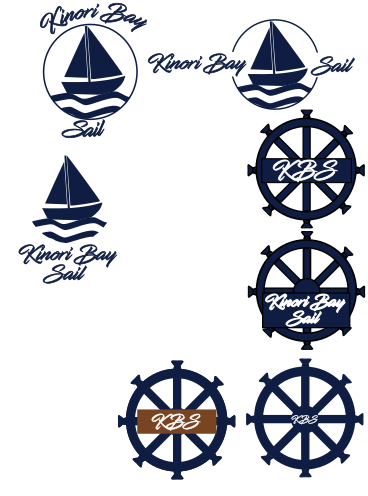 I've been semi on track, creating uniforms and logos for the second expansion team, and beginning to rebrand/rework some teams for 2014. I still find myself wanting this to make a bit more of an impact than it does, considering the effort I put into this. Anyways, on to Weeks 11 - 20. Honnaro's below average start hasn't helped their season at all, but at least the last 10 weeks were better. In that time the Flight went 4 - 6 (2 - 3 home, 2 - 3 away) for a record of 5 - 15 in 20 weeks. The 4 wins came in Week 13 (Raiders), 14 (Magic), 16 (Lions) and 19. Week 19's win was interesting in that it continued the Queens losing streak, and the fact that they won by 10 points is also interesting. The expectation was that their new offseason additions would help them continue their relatively good play last season into this season, but we've seen mostly the opposite. No one in particular is to blame, but the team doesn't seem to fit well together. Madoka Grant has been her usual self, playing excellent defence once again this season. 2nd overall pick Alice Watts has also been solid but doesn't look to be contributing as much as she possibly can, pushing her largely out of the RotY picture. Their offence really hasn't clicked at all this season, with a -99 PD being a big indicator of their struggles offensively. This team is still built to be competitive later rather than now, and if they do end up staying in last, they will at least end up with the 3rd pick next season, which can be used to draft yet more young talent. Expect Honnaro's younger players to start receiving more minutes as the season winds down. The Raiders once again find themselves down near the bottom of the league, even after 20 weeks. Their offseason losses have severely impacted the team's ability to win games, particularly away from home (2 - 8 away, 4 - 6 home in 20 weeks). The last ten weeks have seen the Raiders go 3 - 7 (2 - 3 home, 1 - 4 away) once again, repeating their last ten weeks. Their wins came in Week 11 (Flight), 18 (Flight) and 20 (Lightning), with another shock win against the Lightning the only real highlight in what was once again a disappointing ten weeks for the team. Bench O4 Caitlin Nakayama looks to be a possible contender for Sixth Woman of the Year, making good use of her high minutes off the bench, averaging just under 7 rebounds and 7 points a game. Last year seems to be a fluke, much like 2010 seems to be 3 years on. The Raiders are under-performing to an extent this season, and with two new expansion teams joining next season, they don't have as much chance to build through the draft. 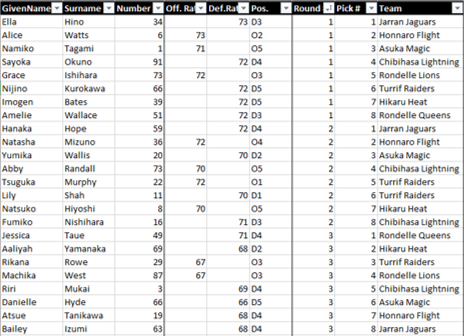 This year's draft picks Nijino Kurokawa, Tsuguka Murphy and Lily Shah have all been solid this season and will likely see more minutes as the season continues. Next season should give a good indication if it is time for the Raiders to blow it all up and focus on the future. After the last being Northern Conference Champions the last 3 seasons, the loss of Sanako Shinohara and few other players has expectedly hurt the Heat, pushing them into fighting for the second spot in the Northern Conference. Going 5 - 5 once again in the last 10 weeks (2 - 4 home, 3 - 1 away), the Heat find themselves floating at .500 for once again, only behind the Lions on PD. Their wins came in Week 12 (Raiders), 15 (Jaguars), 18 (Lions), 19 (Raiders) and 20 (Flight). No wins (other than the win against the Lions, who are also 10 - 10) came against teams better than them record wise in the last 10 weeks, which shows just how average the Heat's season has been. 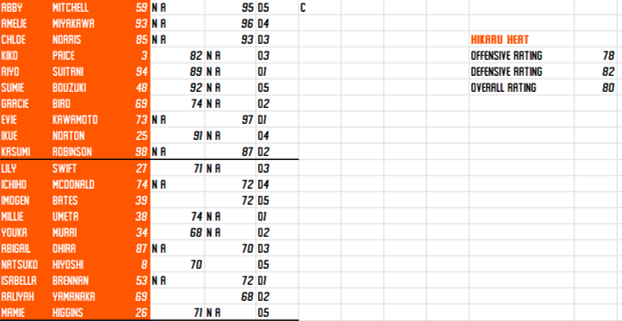 Abby Mitchell has more than noticed this, putting up MVP type numbers to try drag the Heat into the playoffs. Kiko Price has also finally fit in to the Heat's offence, which has been redesigned slightly over the past few weeks to lessen the load on Price. Gracie Bird has also improved this season and is showing signs of being a future star for the Heat. To make it to the playoffs, the Heat just need to jump the 3rd place Magic (who are only a win ahead) to take the second spot in the Northern Conference Finals for the chance to become 4 time Northern Conference Champions. The question is, is this team hungry enough to make the push? 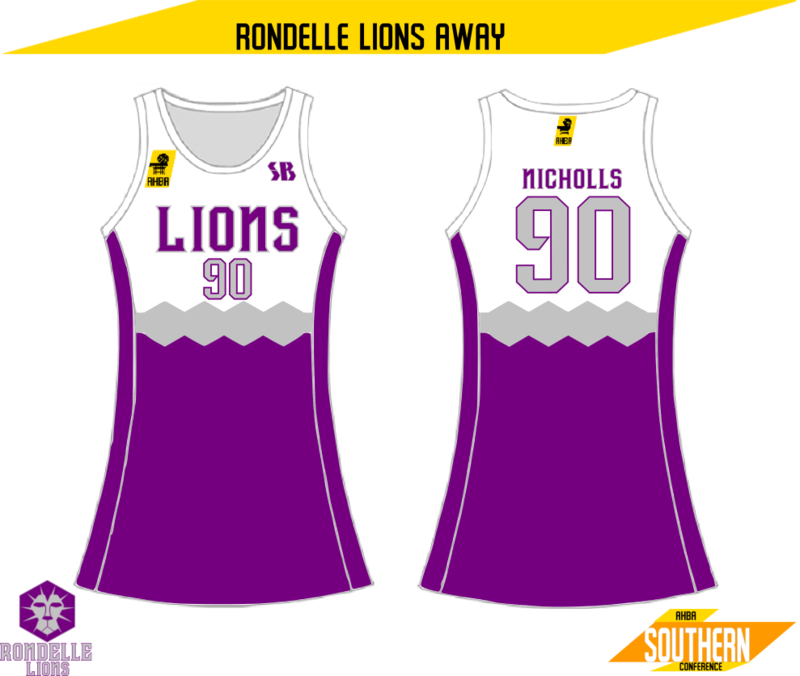 Tied with the Heat at 10 - 10 after 20 weeks, and currently holding on to the second spot in the Southern Conference Finals is the Rondelle Lions. The Lions last ten weeks have had similar results to the team they are tied with, going 5 - 5 (2 - 4 home, 3 - 1). Their wins came in Week 11 (Heat), 13 (Jaguars), 14 (Queens), 17 (Raiders) and 20 (Jaguars). The win against the Queens marks their first win against their sister team this season, making for an interesting playoff series should the Lions make it. Other than the win against the Queens (and the Heat, also 10 - 10) all their wins came against teams lower than them in the standings. This poses many questions come playoff time, especially if they are to be facing an extremely strong Queens team. Another issue is the Queens inability to win at home, which has continued from the first 10 weeks. As for the Lions' Rookie, Grace Ishihara, her play off the bench has been pretty solid, and she plays well alongside bench O1 Lydia Fry, which is good news for the Lions' offence off the bench. The big question for the Lions is can they maintain their spot at second in the South? "As the expansion draft looms over teams once again, the struggle of figuring out who to save is a topic once again, especially as the 2011 Rookies are set to be restricted free agents in the offseason. Whilst some teams are sure they have players locked up, other teams may decide to dangle their restricted rookies if the teams feel as if they can't afford or are unwilling to resign them. The number of protected players has not been confirmed, but is likely to be similar, if not the same as in 2012." - hoopballfeed.com.ac, June 5, 2013. So, I took some time to look around HoopBall. I read the topic and this is in fact interesting. I like the detailing you give to the story, with the interviews and the backstory, and I really would like to see more of this detailing in your uniforms. I'm thinking. 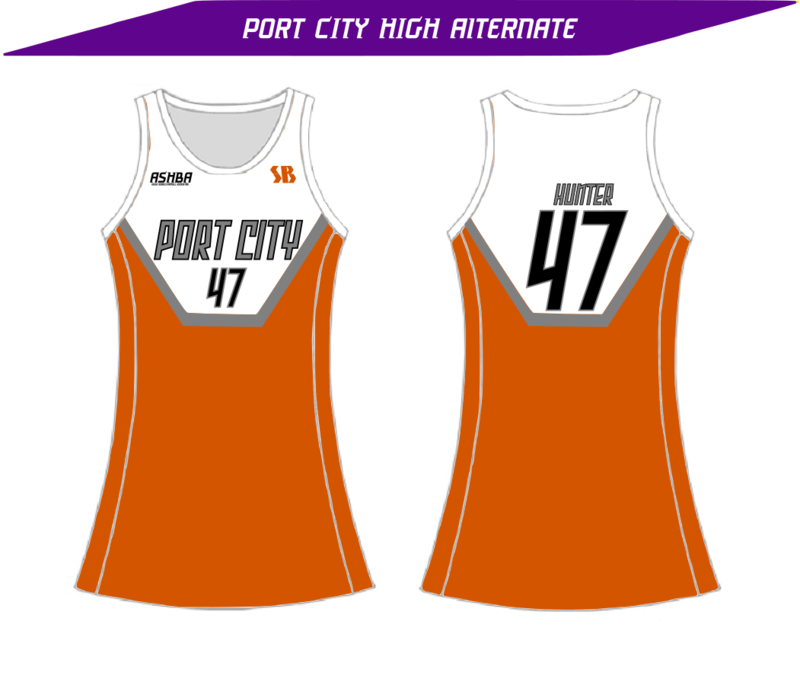 The template is based on Netball dresses, am I right? Depending on what software you use, there are some vector templates around the web. Thanks for the kind words. It's been a while since I've updated this largely due to lack of interest from people around here, but I'm glad you find it interesting. I have a huge passion for writing/storytelling, (to the point that I was doing English a year above my actual year in high school) and I always put 100% into the writing for this. As for the template, I would really love to go to a 3D/Vector style, but most of the ones that I've seen cost money and I'm not interested in spending loads of money on what is a spare time/hobby thing. I have all the Adobe stuff, Inkscape, paint.net, etc. Thing is, HoopBall is played by many nations all of which have completely different ethnic backgrounds, so even if your country Lisander didn't have it's small Japanese community, it'd still be more than welcome to join in on the HoopBall World Championship. I shall see to posting the last part of the season in the coming days.